Pet Wants’ specially-crafted pet food formulas are made in small batches with fresh, natural ingredients enhanced with vitamins and minerals for a complete and balanced diet in every bowl. Pet Wants North Raleigh offers convenient, free, personal delivery to the entire North Raleigh area and the owners are looking to open a brick and mortar store in early 2019. A new local pet food and supply company has just launched in North Raleigh. Locally owned and operated by Ron and Rachel Whidby, along with their daughter and son-in-law Michelle and Joshua Hurley, Pet Wants North Raleigh offers free, personal delivery to all of North Raleigh. Pet Wants’ specially-crafted pet food formulas are made in small batches with fresh, natural ingredients enhanced with vitamins and minerals for a complete and balanced diet in every bowl. Pet Wants North Raleigh has multiple blends of dog and cat food formulas as well as healing salve, calming balm, anti-itch spray, paw wax and more. Pet Wants North Raleigh offers convenient, free, personal delivery to the entire North Raleigh area and the family is looking to open a brick and mortar store in early 2019. The Whidbys and the Hurleys are experienced business owners and they each bring different strengths to the team – from back office and operational experience to marketing and sales. They were drawn to Pet Wants when Rachel started looking for a flexible opportunity that would allow them to work with animals. 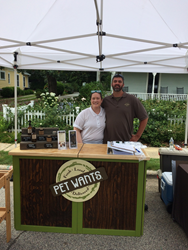 “The world of pet food can be complicated so, for us, I think the most exciting part about this business is having the opportunity to talk to people in our community about animal nutrition and educate them about what’s in the food they can buy, especially in comparison to our products. We want to make sure people have all the information so they can make the right decision for their own family,” Michelle said. Ron and Rachel are long-time Raleigh residents and Michelle and Joshua were both born and raised in the Raleigh area. Ron and Rachel have a 7-year-old coonhound named Summer and a grand-dog named Bell, who is a 9-year-old lab/hound mix. Michelle and Joshua have a miniature dachshund named Bandit. All of their dogs are rescues. To learn more about Pet Wants North Raleigh or to place a delivery order, call (919)908-7584 or visit https://PetWantsNorthRaleigh.com.